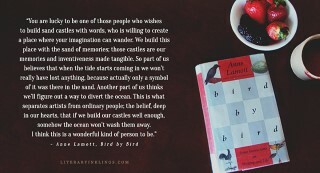 Anne Lamott’s “Bird by Bird: Some Instructions on Writing and Life” was first published in 1994. I don’t remember the exact year I got my copy, but I got it on cassette, so that tells you something. I still have it on cassette in fact, even though I have no way of listening to it anymore. No matter, I listened to it so many times that I can still hear Lamott’s voice doling out her pithy advice and honest disclosures: her reminder that you can eat your first draft, her advice to use a one-inch picture frame as a guide, her admission about calling her counselor after a friend’s writing success. In this little gem of a book, Lamott talks openly about her faith, her sobriety, boyfriends, her son, and so much more. Some criticize this book as a kind of regurgitation of tried and true writing advice, and maybe that’s valid to an extent. But, isn’t all advice mostly made up of things you’ve heard before? Lamott’s advice is doled out alongside personal stories and that makes it both unique and delightful. Take, for example, the book’s title story. In this anecdote, Lamott recalls how her brother procrastinated on a bird project he needed to do for school. Overwhelmed, he sat at the kitchen table and cried until Lamott’s father stepped in and advised his son to take the project “bird by bird.” One step at a time, one scene at a time, one word at a time, if necessary. This is not advice that any writer who has been writing for any amount of time hasn’t heard at least twice before. But, Lamott delivers it with empathy, perfect timing, and a dead-on sense of humor. If you’re a writer in need of inspiration, I’d highly recommend this book.